Your friendly, dedicated dentists and team at Friendswood Dental Group work hard to make every patient feel welcome and comfortable from the moment they arrive. However, despite our best efforts, we also know there are those patients who need a little extra help relaxing and receiving the care they need. That’s why we offer oral conscious and nitrous oxide sedation. If you have difficulty numbing with local anesthesia alone, have a physical or cognitive impairment that makes dental care unsafe or painful, or you experience dental anxiety or phobia, contact our team to find out more about how sedation dentistry can help. For those patients who experience severe dental phobia or anxiety, oral conscious sedation is often the best solution. Patients take an oral sedative prior to ever leaving home, which means the stress related to attending a dental appointment is already significantly reduced before your visit begins. Oral conscious sedation does not put patients fully to sleep, but it does allow them to rest comfortably entering a dream-like state throughout treatment. Patients should plan to have a trusted friend or family member drive them to and from the office, and rest for at least 12 hours following their procedure. One the longest used forms of medical and dental sedation, nitrous oxide, commonly referred to as laughing gas, is inhaled through the nose and creates a euphoric state. 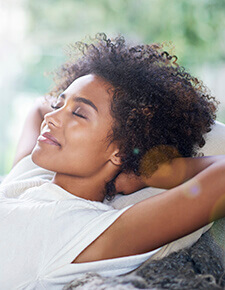 Many dentists rely on nitrous oxide because they are able to quickly and effectively adjust the dosage to offer maximum relaxation and comfort for patients throughout the treatment. The effects of nitrous oxide also wear off quickly meaning patients are able to return to their daily activities right away.